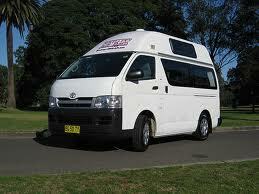 A very popular way of spending your holiday in Australia is to hire a Motorhome or Campervan. The real enthusiast will even go so far as buying one for permanent use. Before you hire your Motorhome or Campervan it is wise to shop around and get quotes from different dealers. If possible book at least 6 months before you arrive. If you arrive during summer holidays (December to February) its virtually impossible to get a Motorhome or Campervan if you have not booked ahead. You also get better rates the earlier you book or during off-season. Before you sign your rental agreement read the fine print carefully and please upgrade from basic insurance to better coverage. Before you drive off you should inspect the vehicle with the dealer and write down ALL damages both exterior and interior before you embark on your journey. Travellers Autobarn have semi-new Campervans for a reasonable price. We hired a Xbase HiTop that comfortably sleeps three adults. The adult sleeping on the top berth should not weigh more than 90 kg. Today we saw two French couples sharing a HiTop, proving that anything is possible. The Campervan has a small kitchen, water from a tap (40 liters), Microwave, LPG gas stove, fridge and plenty of storage. The HiTop is over 3 meters tall so you are limited to on the street parking or outdoor parking areas. The exterior and interior of Travellers Autobarn HiTop is typical of the HiTop range. Travellers Autobarn is suited for Backpackers with a larger budget. If you are interested in buying your very own Campervan Travellers Autobarn sell vans from their pool, so too does other dealers. Approx cost is 3.000 dollars for 30 days (incl. insurance) Read more here. Jucy Campervans have a green and purple paint job and are easy to spot. They come in ‘one size fits all’ with an option to have a Penthouse on top of the vehicle (Choppa) which sleeps another two adults. Jucy Campervans are equipped with kitchen, fridge, stove and storage space. Jucy is suited for Backpackers on a medium to big budget. Jucy seems to be more popular with girls travelling in a group. Maybe its the colours or that the vans are easier to drive due to its smaller size (guys like it big and girls like it cute – sue me). Approx cost is 2.500 dollars for 30 days (incl. insurance) Read more here. Spaceships Campervans have the same model van as Jucy but without the green and purple paint job. You will not find as many Spaceships travelling around compared to Jucy so if you want to be sort of unique then go for Spaceships. Approx cost is 2.500 dollars for 30 days (incl. insurance). Read more here. Spaceships Campervan with extended pocket. Wicked Campervans have a stained reputation as their Campervan pool is really old and they do not service them very well. The one thing going for this ‘lemon’ is its cool exterior. Each Campervan is painted in a unique way. They also draw slogans like “I am a virgin on tour catch me if you can” on the rear of the Campervan to get fellow motorists attention. Their vehicle pool range from cheap and old to newer 4wd vans. Wicked is one of the cheapest dealers and you truly get what you pay for. The vehicle we rented even came with its own ant farm (which we decided to clean out with chemicals). Wicked is suited for Backpackers on a tight budget with an ‘attitude’. Approx cost is 2.000 dollars for 30 days (incl. insurance). Read more here. 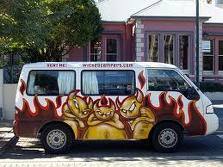 See a video review of Wicked Campervans here. Hippie Campers are a step up from Wicked Campers. They have newer model Campervans and seem to be more up to date and better serviced. HippieCampers are suited for Backpackers on a tight budget. Approx cost is 2.500 dollars for 30 days (incl. insurance). Read more here. Backpacker have a variety of vans very similar to Travellers Autobarn. The vans we have seen on the road and in camping sites look well serviced and not too old. 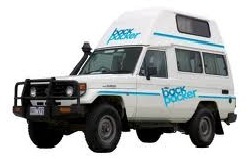 Backpacker Campervans are suited for Backpackers with a larger budget. Their vehicle pool is not very large so you need to book ahead. Approx cost is 3.000 dollars for 30 days (incl. insurance). Read more here. 4WD Backpacker ready to tackle the Outback. 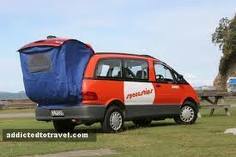 CamperMan Australia have similar cars to Backpacker and Travellers Autobarn. We have heard from fellow travellers that you can get some very good deals if you book early. Their Campervan pool has both Hi-top vans and larger Motorhomes. CamperMan Australia is suited for Backpackers with a larger budget. Approx cost is 3.500 dollars for 30 days. Read more here. Maui Campervans are magnificent homes on wheels. Some of the Campervans are so huge that they could easily fit a family of six. With these motherships on wheels you are restricted to travelling on larger roads. Going into a larger city would truly test your driving skills. The more popular range is the Platinum Motorhome as it is more suited for beach vacations. To rent one of these castles on wheels will set you back a minimum of 200 dollars per day. Maui is suited for families or couples (executive style). Be sure to look out for promotions that can save you up to 20% if you book early. Approx cost is 4.000-6.000 dollars for 30 days (incl. insurance). Read more here. Apollo is the largest privately owned recreational vehicle operator in the Southern Hemisphere so you can rest assure that you will see fellow Apollo Motorhomes on the Highways. 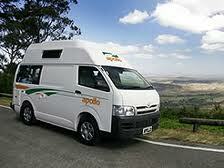 Apollo has not only plenty of vehicles they also have a large range from Hi-Top Campervans to huge Motorhomes. For the adventurous they have 4wd drive Motorhomes that will bring you out to the Outback and back to civilisation without problems. Apollo is suited for families or couples (executive style). Approx cost is 4.000-6.000 dollars for 30 days (incl. insurance). Read more here. Britz is a well known and proven dealer that maintains a high level of service. They brag about their price guarantee and claim not to be beaten on price. Its up to you to challenge them. Britz vehicle pool is similar to Apollo and Maui. Popular models are HiTop, Frontier and Challenger 4wd. Britz is suited for families or couples (executive style). Read more here. Around Australia Motorhomes range from HiTop Campervans to six berth Motorhomes. It is not often you come across Around Australia Motorhomes in camp sites around Australia, but they seem to be well serviced with happy renters (when you see them). Read more here. 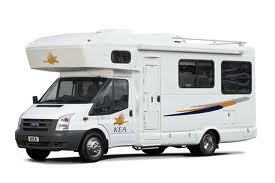 KEA Motorhomes and Campervans are really well serviced and look great. The 2+2 Berth Flip-Top is a great Campervan that really stands out among the rest. Unfortunately KEA know they have a great range and this is reflected in their pricing. Read more here. KEA 6 berth Motorhome. See interior here. This entry was posted in Australia on 2011/01/06 by Trailsurfer. how was your trip in your campervan? Have you had a good time? Would you be keen to write a bit of a blog story for us? Make your holiday funds go further with UK motorhome hire with your family or a group of friends and you can split the cost. Even in the summer, motorhome hire will cost less per person than a hotel. Holiday time is limited. Hire a camper van and get a week or two of vacation time. Of course money is always a factor and most of us will not have the funds to spend too much.